Because of the complexity of turning, the Rovers onboard computer coordinates all drive and steering events. Because this is a LEGO® implementation we are using a LEGO® Mindstorms RCX 2.0 to control YogiCub. Drive and pivot to trace out a triangle. Drive and pivot to trace out a square. However we can use the RXC for a lot more than just coordinating steering  Which for a computer is a snap anyway. The RCX has a lot of inherent functionality apart from its physical Input / Output (I/O) capabilities. It has the ability to communicate via Infra Red (IR) to other computers or RCXs. It has a portable power supply (8x AA Batteries) which it uses to run external devices (like motors and sensors), and most importantly it is programmable. Almost any type of rover behavior can be written into software and down loaded into the RCX. We can use the RCX to implement aspects of other Rover subsystems such as the Telecommunications, Control, Navigation, and Power subsystems. YogiCub communicates through the RCXs IR port. Mechanical control is achieved through the internal workings of the RCX linked to the 3 external output ports. Power is managed through the RCXs own internal battery and firmware monitoring functions. 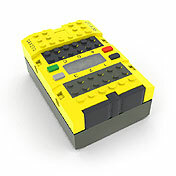 The LEGO® RCX is a tiny computer based on a Hitachi H8 series microprocessor. This 8-bit CPU provides most of the control logic for the RCX including serial input/Output (I/O), Analog to digital conversion, and built in timers. Various sensors and motors may be connected to the RCX, allowing it to perceive and interact with the world.